Sorry it’s been a while but I’m back with a cheeky festive party dress. This is my last Minerva Blogger make of the year and I’ll be taking a break for a while so I can focus on sewing from my ever growing stash! 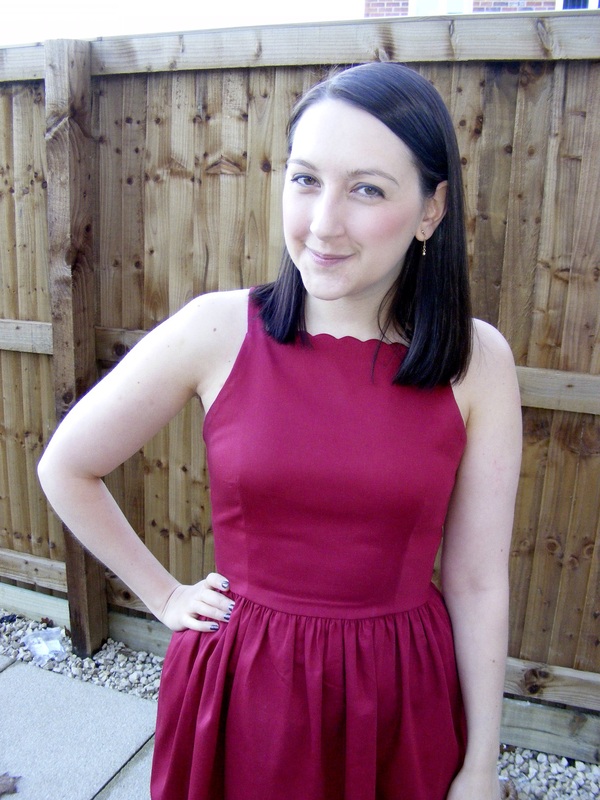 This is the Flora dress from By Hand London. I’m really pleased Minerva have started stocking BHL patterns. I wanted to take on the Flora dress but make it my own, so I decided it needed scallops! My indecision over the pattern was over the high-lo hem. I’m really not sure that trend and I will ever be friends. 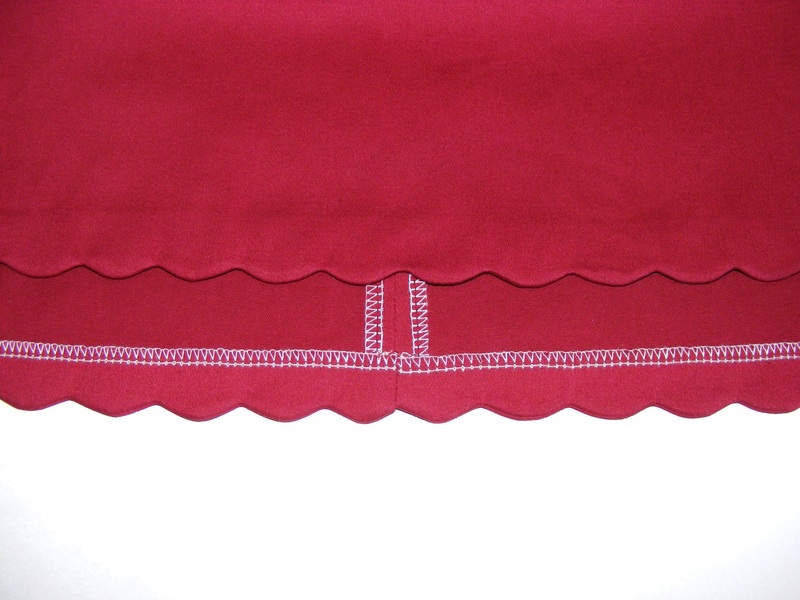 But when I saw this wine coloured stretch cotton fabric I had an instant idea for some scalloped goodness. It’s pretty much like cotton sateen but with a duller shine. It feels and looks richer than its price tag but gosh does it attract fluff. 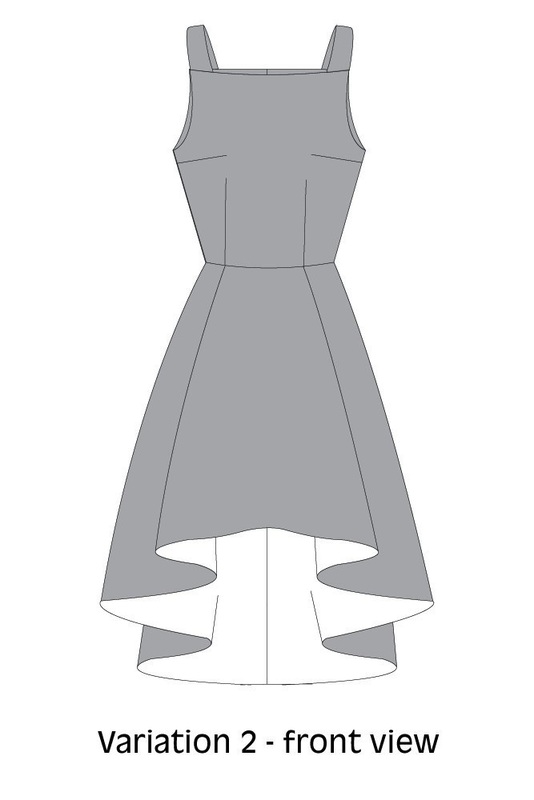 So I made a few adjustments to the pattern, I rotated out the front bust darts into the waist and in the end I decided a gathered skirt would be easier to scallop rather than the circle skirt. I used the adjustable scallop stitch on my machine along with lots and lots of measuring to achieve the right number along the bodice front and back, plus I self-lined the bodice and used a hem facing to make the scallops as clean as possible. 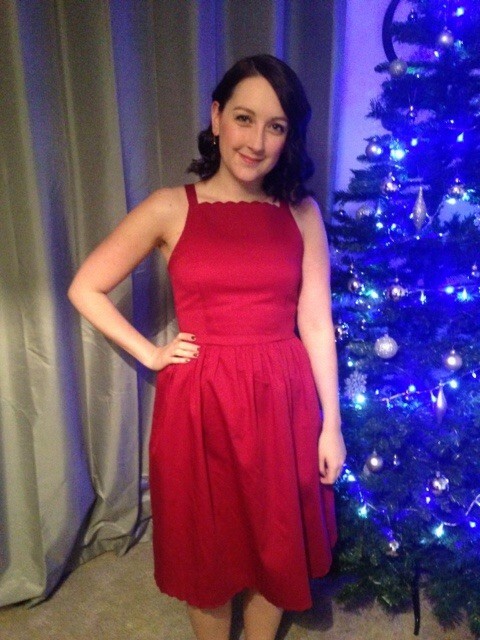 The dress was worn to my work Christmas party with matching satin shoes, gold jewellry and big curly hair. It went down a treat! So pretty pretty pretty – the colour, the mods you made, the scallops and you look so lovely in the last pic! Smashing frock. 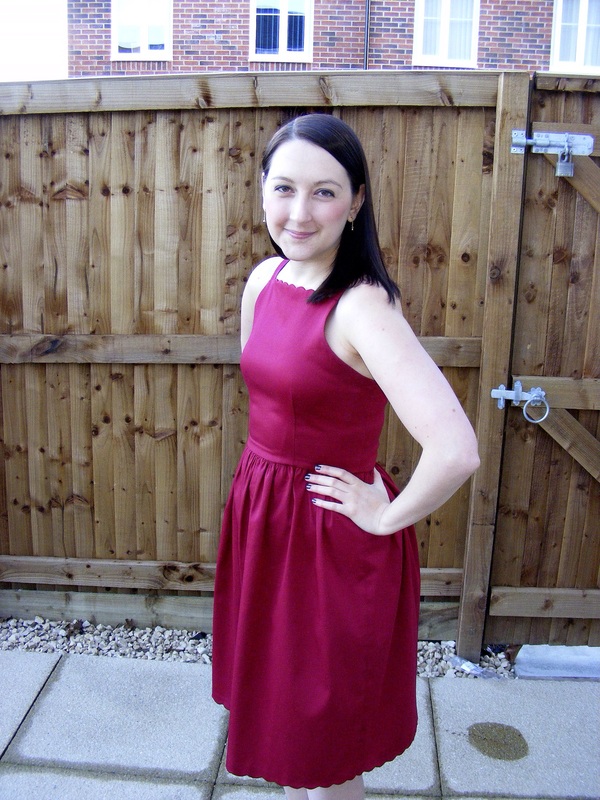 This looks amazing – Flora is a great party dress design and the colour really works on you! Gorgeous Amy! Looks like the bodice fits you perfectly 🙂 And you machine has an adjustable scallop stitch?! What is that?! How cute are you?! What a great color! Truely a perfect party dress, the colour, the texture, the shape and those scallops. Inspired. You look gorgeous in this! Happy christmas. One of the best blogged Flora to date. This colour works wonderfully with your complexion. You must have received tons of compliments during the party. I LOVE the scallops, they’re fantastic! What a great idea. There is such a thing as a scallop stitch? I want that!!! Beautiful, beautiful dress. I love it. Very pretty! I love the scalloped trim! Gorgeous party dress and great idea with the scallops. Merry Christmas! I Meant the scalloping in this dress 😀 absolutely stunning!